My supply of Scrabble tiles is dwindling down! Yay! I love the magnets I’m creating, but the process is long and boring. I even bought a new crafty glue gun, which is cute and makes me swear a little bit less, but I’m ready to live in a world without Scrabble tile crafts. 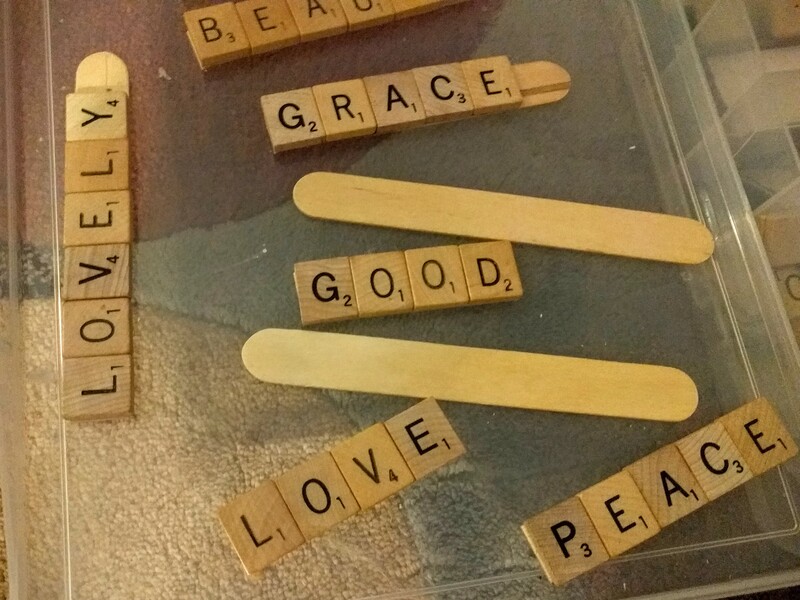 I picked up popsicle sticks at the dollar store and started gluing the Scrabble tiles to them instead of cardstock paper. Lesson learned from the first go-ahead was to work with wide ribbon, so I pulled out pretty dotted ribbon, purple ribbon, and black and white lace ribbon. How cute are these magnets with the red and white dot ribbon? 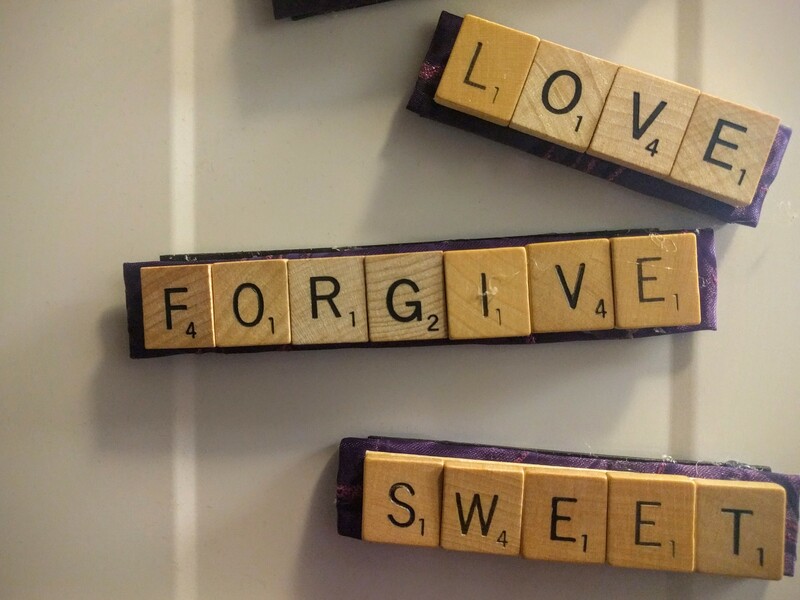 With the leftover Scrabble tiles, I created as many positive words as I could. 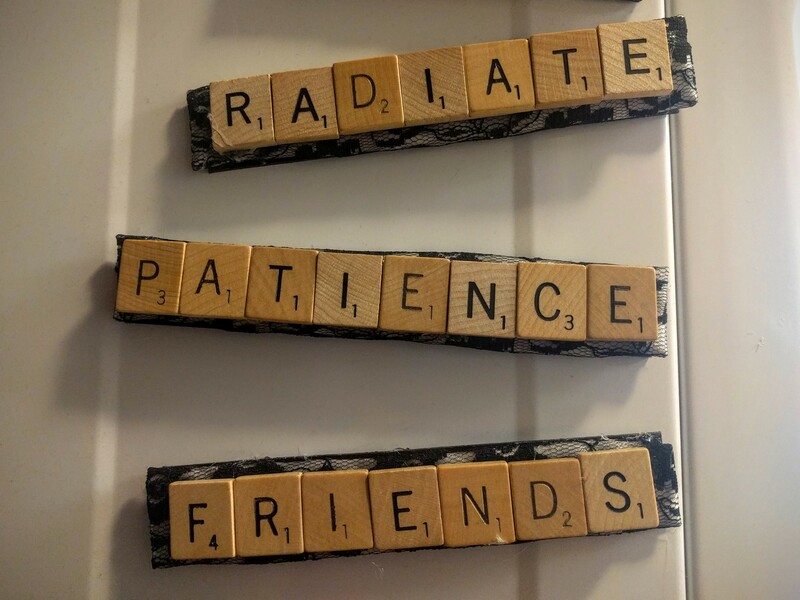 Surprisingly, I ended up with four sets of five magnets, and now, I have all the letters people don’t want in a Scrabble game (which I glued to two wooden frames in this post). Armed with a lazy Saturday and Amazon Prime in front of me, I finished the Scrabble tile magnet projects … well, most of them. I ran out of magnetic strips, and I want to pick up one more roll of ribbon for some of the guy names. With the positive word magnets, I simply folded and glued the wide ribbon into a rectangle. 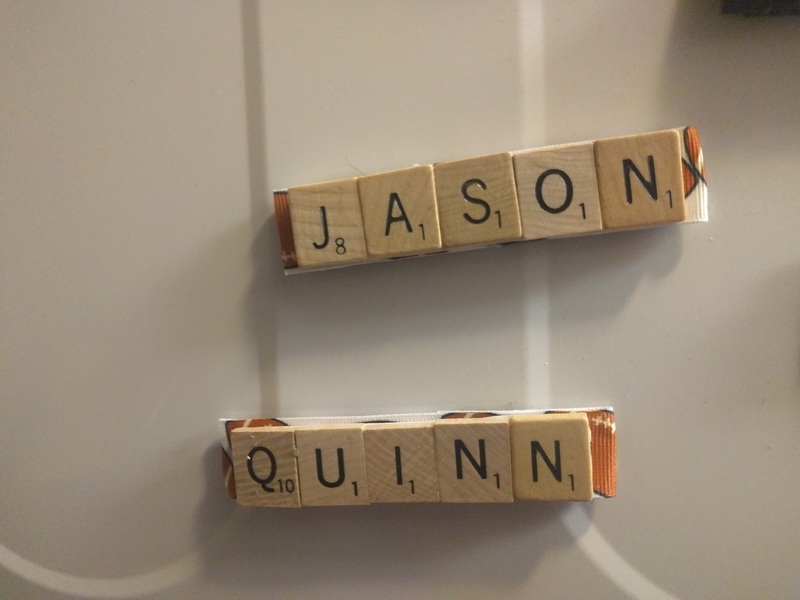 When the glue dried, I glued the Scrabble tile word on top of the ribbon and a magnetic strip on the bottom, covering the folded edges. Beautiful! To add a little pizzazz to the guy names, I picked up some ribbon with footballs on it. Not the most creative, but it works for me. 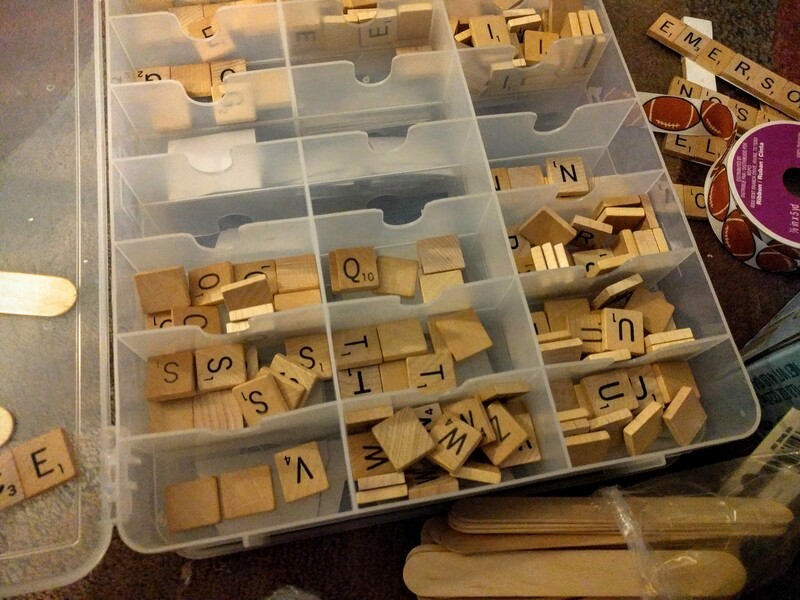 As soon as I find more magnetic strips and another ribbon roll, my Scrabble tile projects are finally complete! Yay! I love the magnets. Nice job! I like the magnet idea better than Christmas ornaments because I don’t think anyone can have too many magnets and ornaments you bring out once a year. Magnets are better. Thanks for the idea. OK, never mind … I see another ad … it changes. Um, I also see a Donald Trump ad … better not be a paid ad. I love love love love love the red dotted magnets! If I ask nicely, would you make some? Please? I’m one of your oldest friends!!!! I love these magnets! 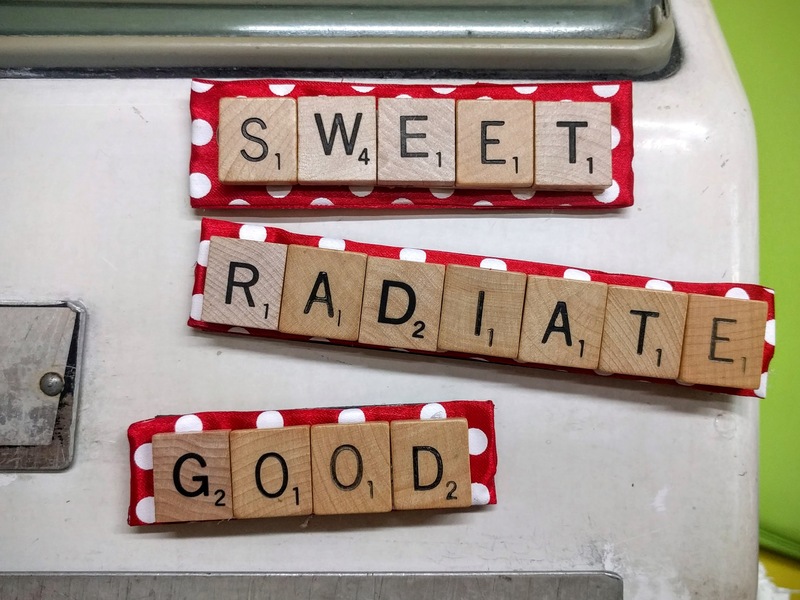 I see Scrabble tiles on sale at flea markets all the time but I never thought about turning them into magnets or ornaments. Great idea. Thanks!